Tickets for this year's T in the Park music festival sold out in record time after fans queued through the night. 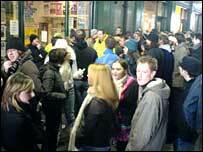 There were lengthy lines of music lovers outside shops across Scotland when their doors opened at 0900 GMT. 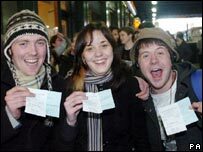 Music fans queued in Glasgow and Edinburgh for hours on end and while there was joy for many, others had to be turned away in disappointment. The Strokes are the latest addition to this year's line-up, joining The Who and the Red Hot Chilli Peppers. The Arctic Monkeys, Primal Scream, Kaiser Chiefs and the Ordinary Boys are among the other acts who will perform at Balado near Kinross on 8 and 9 July. The queue outside Tickets Scotland in Glasgow's Argyle Street almost circled an entire city centre block. A cheer went up as the shutters were raised at 0900 GMT on Friday. At the front of the line were friends Janet Hannon, Lisa Smith and Jemma and Penny Angus, from Glasgow. They began queuing at 1630 GMT on Thursday and said that they had enjoyed a "quite cosy" night on the streets. Glasgow students Lorna Ronald and Ashley Croll, both 19, also began queuing at the same time. "We knew the queue would be really big and we just really, really wanted a ticket," said Lorna. "It's the first time we've been but pals have told us it's really good." 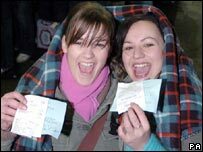 Further back in the queue was 17-year-old Lisa Smart, who travelled from Falkirk to make sure she secured a ticket. "If you want a ticket and you haven't got a credit card you have got to come along and buy them," she said. "A lot of people going to T in the Park haven't got credit cards, it's a working-class event, so you need to get up to buy them. If you're not here you're not going to get them. "It's the biggest party in Scotland, you don't want to miss it." However, queuing was no guarantee for Toni Di Nardo, who had been in the Argyle Street line for five hours on Friday morning. Putting on a brave face despite the disappointment, he said: "We thought we would have got tickets by standing in the queue and were waiting our turn. "But at about 1220 two stewards came down the line to tell people the tickets were sold out. "This was really annoying for many of the disappointed people who queued in the cold. "If we had known there was no chance of getting the tickets we would have tried by other means." More than 170 acts will perform at the festival, which will be attended by about 69,000 revellers. Organisers put a limited number of tickets for the 2006 festival up for sale the day after last year's event and those were snapped up within four hours. The remaining day and weekend tickets were sold out at ticket websites and other outlets before 1000 GMT on Friday. Weekend camping tickets with a face value of £115 began appearing on online auction sites on Friday with some on offer for as much as £700. Organiser Geoff Ellis said: "Once again music fans have shown that T in the Park tickets are the most hotly sought-after in the UK." He urged those who did not secure tickets not to buy them from touts or unofficial websites.